A few bites of papaya that was sitting on the counter. I was kind of confused since I woke up early and nobody was home on a Saturday morning. Turns out my parents had gone to the dentist for their teeth cleaning or something. Oh well, I went back to sleep haha. Lunch was leftovers from last night's dinner, along with part of a bowl of watery porridge with mung bean (not the sprout, just the bean). I wasn't too fond of the porridge because I hate the flavor of mung bean, so I mostly just ate leftovers which were those rice ovals and stuff. – Butterflied jumbo shrimp cooked in a light soy and vinegar-based sauce. The shrimp were so big and really tender, I wish I had room to eat more during dinner. – Sauteed green beans with garlic and Chinese spicy shredded pickle. 1. Combine soy sauce, apple juice, honey, syrup, and garlic together, stirring well to dissolve the honey. Set aside half of the marinade for basting later (add the sesame oil to this basting sauce, but not to the marinade). 2. Pour marinade into a large ziplock bag and put salmon inside to coat. Marinate for 1-3 hours in the refrigerator, or just 45 minutes at room temperature if you are in a rush. I actually couldn't find a large enough ziplock bag, so I did this in a glass casserole pan on the counter, and was standing around basting the salmon every so often so that it would be well-coated. 3. 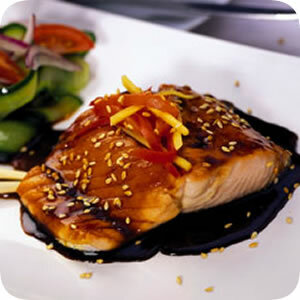 Drain salmon, discard marinade. Broil salmon 5" from the heating element, for 5 minutes. Then pour on basting sauce, and return to broiler for another 10 minutes, basting often with the sauce in the pan. The salmon is done when the middle is a shade of pink just a little bit darker than the meat on the edges when flaked with a fork. If you like your salmon more well-done, wait until the middle is the same color as the edges. This entry was posted on Tuesday, May 15th, 2007 at 2:39 am	and posted in Chinese, cooking, fruit and nuts, Japanese, recipes, seafood, Uncategorized. You can follow any responses to this entry through the RSS 2.0 feed.